This is an amazing product and easily available in the market. Manufactured by Char-Broil, this product is the right size, making it easily portable. They have also incorporated the TRU-infrared technology for perfect grilling. It comes with a warranty of five years on the stainless-steel burner, five years on firebox and lid and all the other parts have a warranty of one year. It grills your food evenly and even features its own thermometer for inspecting the heat. Also, grills your meat perfectly with the capability to broil them, and it generates really good grilling without any flare-ups. The barbecue also works by using minimal propane to grill as it cooks meals fast, and can serve up to 6 people. The model fits quite easily within the RV storage compartment. Also, the igniter works well and even efficiently. You will find that it is extremely firm and sturdy. The latches are strong and firm. The product even has a control device knob which lets you control the flame, and even a press button ignition that happens to be quite efficient. Also, it has a tiny opening for lighting with a matchstick; the opening can also be great for you to inspect the flame. The heat cannot be controlled since it does not have any fuel gauge for the propane tank. You will discover that the starter also fails to function except if you cover the air-flow opening by the regulator. 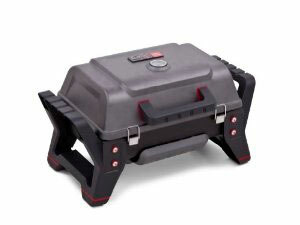 This grill catch tray on the base tends to be a bit difficult to take out at times. The grill’s front handle is not deep enough, making it a hazard as you can touch the hot grill with your hand and get burnt. It does not have a cart or stand choice, and also it lacks a place for hanging your tools for grilling. It is also difficult to cook food such as fish because it sticks on the grill because of the extreme temperatures. You can be sure of an amazing outdoor cooking experience with the Char-Broil Grill 2 Go X200 Gas Grill throughout the year. You may as well place a pan on the grates and even make meals a lot more, making this product a must have for those that love grilling. Assembled Depth (In Inches) 13.6 In. Assembled Weight (In LBS) 20 Lbs.